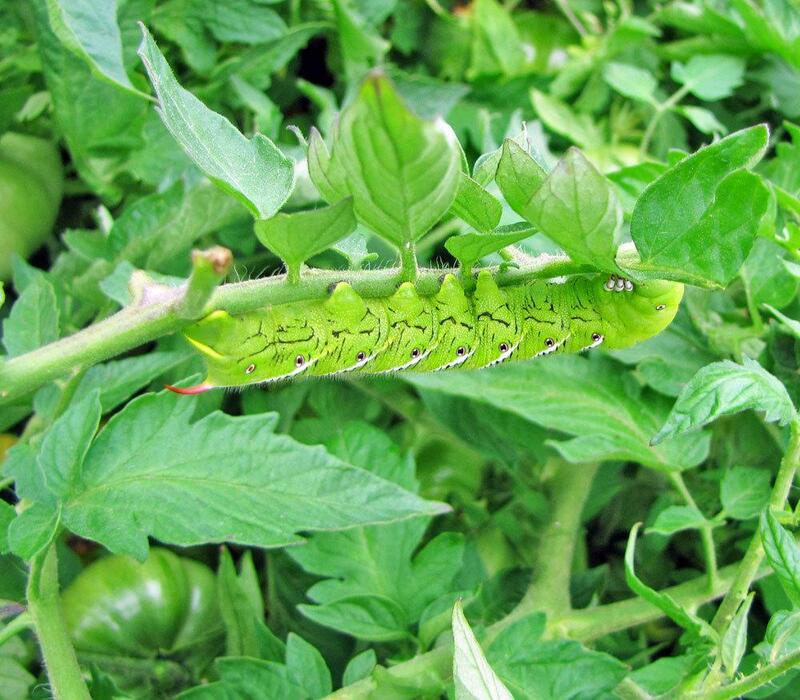 Found throughout the United States, these large, fat caterpillars feed voraciously on the leaves and fruits of tomatoes, peppers, eggplants, and potatoes. Adults are rather spectacular sphinx moths: grayish-brown with orange spots on the body and a 4- to 5-inch wing span. After overwintering in the soil in 2-inch brown spindle-shaped pupal cases, moths emerge in late spring to early summer to lay greenish-yellow eggs on the undersides of leaves. Caterpillars feed for about a month, then enter the soil to pupate. There is one generation per year in the North; two or more in the South. Use Bacillus thuringiensis (Bt) when caterpillars are small. Hand-pick and destroy large caterpillars. Don't worry -- caterpillars cannot sting with their ″horn.″ If you find a caterpillar with what looks like grains of white rice attached to its body, do not remove it. The ″grains″ are the pupae of a parasitic wasp that attacks hornworms. Leave the parasitized caterpillar in the garden so the pupae it carries can turn into more wasps to help control other hornworms.